Floating Water Bridge Is Straight Out Of The Abyss | OhGizmo! By Evan Ackerman on 10/05/07 • Leave a comment! Water is pretty bizarre stuff if you take the time to think about it, but when you combine water with electricity, things start to get even weirder. 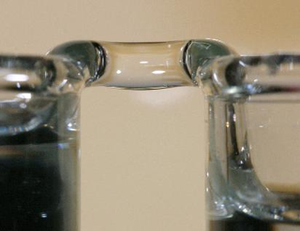 Researchers at the Graz University of Technology in Austria have just discovered that if you expose water in two separate beakers to a high voltage, the water will climb up out of the beakers and form a floating water bridge up to 25mm in length. The researchers admitted to being “surprised” that water would act this way. I guess they never saw the movie.